Firefox Campus Edition.. Say What? Later today Mozilla will do something a bit out of the ordinary and release a special "Campus Edition" of their Firefox web browser, just in time for back to school. Firefox Campus Edition is your typical run-of-the-mill Firefox release bundled with three school friendly add-ons: Zotero, FoxyTunes and StumbleUpon. Zotero is a research tool that helps you collect, manage and cite your research sources. FoxyTunes lets you control your media player from within Firefox while the StumbleUpon toolbar helps you discover interesting web content based upon your preferences. 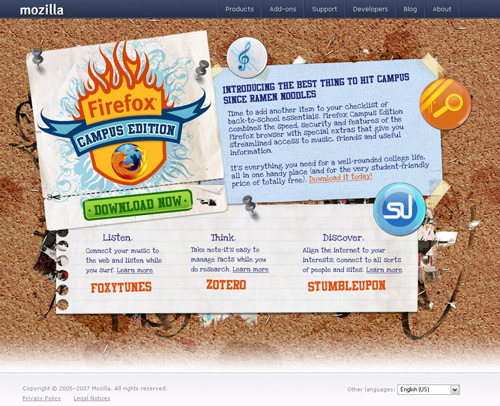 Firefox Campus Edition isn't the first Firefox "edition" of something. Last month, Mozilla released an eBay Edition. Now, I can't help but wonder how much money Mozilla stands to make off such partnerships. Hey Paul: There is no money changing hands for the Firefox Campus Edition. We are looking at ways to introduce Firefox add-ons to people who might never otherwise have tried them, and reached out to a few add-on developers we thought had created interesting functionality on top of Firefox. You can download Firefox Campus Edition at firefox.com/backtoschool later today on Wednesday 8/22. Thanks to Jessica Waight for the info.